Boy, it sure is hot here in the ATL! Temperatures have reached the mid-90s with no end in sight. Of course with all the heat, the one thing I am most obsessed with is...my hair. What in the world can I do with hair this long? Braidouts? Nope. Curls? Probably Not! So, my new thing is updos and ponytails. 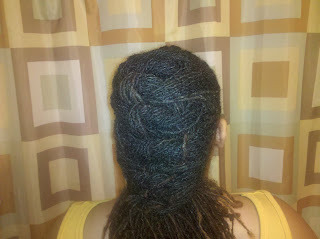 Here's a few pics of my latest (messy) hair do. Any suggestions for cool summer 'dos are welcome! Wow, somebody got a serious tan! This is a very cute style! 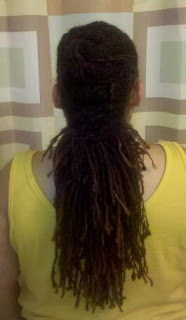 The style is awesome and your locks are beautiful! Wow, indeed great article. How will I find your subscription? I just could not go away your website before suggesting that I actually enjoyed the usual information a person provide to your visitors? opening in IE, it has some overlapping issues. I simply wanted to give you a quick heads up! great info you've got here on this post. I will be coming back to your site for more soon. support of his web site, as here every information is quality based information. Thanks a lot for the share, great info to know.